Who is the real evil? CAMP LUKBAN, Catbalogan City – The 8th Infantry Division, as always, is the target of criticism and complete detestation by the defrocked priest turned NDF-EV Spokesperson, Mr Santiago Salas. However, this time, the loud mouthed former priest included in his never ending complaints the SIPPAD, a multi-sectoral assembly for peace and development backed by the three bishops of Samar Island. “What a pity this misguided rebel priest has become. He is really determined to do everything to prevent peace and prosperity in Samar Island. He will continue and will relentlessly push the issue just to prevent development for he knows for a fact that it is only development that will end the 40-year long existence of CPP-NPA-NDF, an organization of deceit and violence headed by people whose main interest is for personal advancement. “When will Mr Salas stop this kind of baseless accusations and cease from preventing progress? Why can they come down, join the mainstream society and participate in our projects in quest for peace and prosperity? Isn’t it better to join our efforts to alleviate the lives of those less fortunate instead of criticizing those people and organization, government and non government who are doing the right thing for our own people? I really pity Mr Salas. He is a victim and a slave of an erroneous belief and selfish leaders. Since Fr Salas constantly criticizes the road projects, I’d like to ask him what he and the organization he protects has done to give our people a better life. I know the answer already but I want to hear from his big mouth. It’s a big “NONE”. If Fr Salas will succeed in preventing the road project, which I strongly believed will not, what alternatives does he have? If he is really for the people, why can’t he tell the people publicly his own plan to ease the Samarnons from the difficulty of having no roads particularly in the tri-boundary of Samar Island” says Major General Mario Chan, Commander of the Army’s 8th Infantry Division. It is nothing but common to CPP-NPA-NDF to criticize the military having been the government spearhead in defeating its armed component, the NPA. 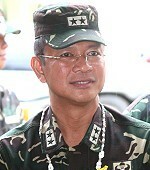 However, it is very rare and it is new that this group directed its criticism against the Bishops and accused them of aiding the AFP in its Oplan Bayanihan which they said as no different from Oplan Bantay Laya in pursuing the purely military solution to armed conflict as well as eschewing human rights and international humanitarian law. This baseless statement is equivalent to accusing the Bishops of aiding the AFP to commit violation of human rights and international humanitarian law. This is a display of disrespect at its best and must be condemned by the church. More surprisingly, Salas chastised and accused the Catholic Church in Samar of waltzing with the military through SIPPAD. Salas even questioned the Catholic Church by saying that the Bishops are turning their backs away from the majority of its flock who are mostly peasants. These statements of Salas were seriously contested by Major General Chan. Demonstrating again the ignorance of the NDF-EV Spokesperson, Fr Salas has been repeatedly bringing out the issue that the Oplan Bayanihan is based on the US Counter-insurgency Guide. Isn’t he really aware that “Bayanihan” is a virtue integral to every Filipino? Bayanihan is the natural character of a true Filipino who is always ready to join hands to accomplish matters that cannot be done without the help of each other. What a shame to Salas. He forgot the ways of a real and genuine Filipino. He might as well join his fellow big mouth coward Jose Maria Sison in Netherlands. Fr Salas also chided that while the Commander of 8th ID is talking of peace and developments, the soldiers are conducting offensive operations in Samar and Leyte. Gen Chan affirmed and said that it is true but not accurate. The rebel priest NDF-EV spokesperson further said that Major General Chan crowed to the media about receiving new weapons, electronic equipment and military vehicles from the US. Likewise, Salas’ statement was affirmed by Major General Chan. However, he (Major General Chan) laughed and slammed Salas’ informant for giving him (Salas) inaccurate information. “Yes it is also correct that we acquired and we will continue to acquire many of these equipment as part of the AFP modernization program. However, Fr Salas was given wrong information when he said that the new equipment came from the US. The equipment were actually purchased from Korea and not from US. Anybody can confirm it. Check the brand of the new vehicles, its KIA vehicles. Fr Salas, your intelligence networks is not giving you the right information leading you to give false statements” says Major General Chan with a big smile on his face. Fr Salas also recycled the issue that the US is at the back of the road projects. General Chan once again categorically declared the allegations of NDF-EV to be baseless and immaterial. He repeated his statement on June 2 of this year. In his final statement, Fr Salas urged the people of Samar to strengthen their militant and revolutionary struggles against 8ID. He said that the people must strengthen the struggle for human rights and other socio economic reforms and support and join the revolutionary struggle for social justice, national freedom and democracy. Salas, as he always be, is confusing the people through this statement. It may be nice to hear for some with low level of understanding and adventurous attitude. But it serves its purpose. It is really the objective of Salas’ final statement to deceive people. He is promoting protection of human rights but he is urging the people to strengthen their militant and revolutionary struggles against the legitimate Armed Forces of the country. We all know that nobody can prevent bloodshed and loss of lives in a militant and revolutionary struggle. We also know that the right to life is the highest form of human rights. Isn’t he, himself, Fr Salas, violating the people’s right to life when he urged them to strengthen the militant and revolutionary struggles? Now, it is left to the people to conclude who is the real evil? Is it the 8ID together with SIPPAD backed by the three Bishops or the dismissed priest turned rebel and Spokesperson of NDF-EV, former Fr Santiago Salas? MANILA – Amid Bishops’ involvement in the scandalous Sports Utility Vehicles (SUVs) and money released by the Philippine Charity Sweepstakes Office (PCSO), a group of women advocates working in grassroots communities urged the government to pursue investigation and penalize those who will be proven guilty. QUEZON CITY – “The Davao City punching-of the-sheriff incident definitely shows the city leadership’s penchant to use force against its people and arrogant display of authority against the sacral human rights of individuals and utter disregard of the rule of law,” said ANAD Rep. Jun Alcover. The ANAD solon said that even as Davao City Mayor Sarah Duterte-Carpio bears that inherent duty to maintain law and order in the city, amid the demolition order duly issued by Judge Manuel Carpio of the Davao City Regional Trial Court Branch 16, “Her punching of the court’s Sheriff, shown in TV news footages, smacks of sheer arrogance of power and authority reminiscent of her father’s administration, now City Vice-Mayor Rodrigo ‘Digong’ Duterte, who effectively implanted fear among his people and cow-towed Davaoeños to submission,” he explained. “No one easily forgets when lives were easily snapped by bullets fired from the firearms of Davao Death Squad personalities reportedly upon orders of then City Mayor Digong Duterte,” Rep. Alcover quipped. Referring to the order of Mayor Duterte-Carpio terminating all assistance of the city government to the Davao City Hall of Justice, “Understandably, she and Digong are indeed one and of the same breed. This happened to the PNP, to an Army brigade under the 10th ID, PA, and I will not be surprised if she does the same to the Judges and employees at the Davao City Hall of Justice,” he stressed. “With the ‘I punched the sheriff’ story already hitting the international wires, there is truth to the saying - - Like daughter, like father! Absolutely, this is a blatant display of – placing in her hands the law and authority of the public office she represents, which is frowned and shunned by the civilized world. Only tyrants do with out remorse! ” he added. Reminding public officials of the Code of Conduct and Ethics that must be observed while in office, “I call on the Secretary Jessie Robredo of the DILG to make good of his statement to subject Mayor Duterte to an administrative investigation,” Rep. Alcover said. “While the Local Government Code extends to local government Chief Executives explicit powers and authority to efficiently and effectively deal with the affairs of his political jurisdiction, this is not absolute. There are still laws and statutes that must be faithfully observed. Anyone who violates these must be dealt with accordingly and swiftly, if only to send a message that we are a government of laws and not of braggarts” he stressed. Women’s rights group Tanggol Bayi today commended Davao City Mayor Sara Duterte for supporting the plight of the urban poor in Agdao, Davao City by her intervention in the demolition of the houses and shanties in the said area, that was supposed to affect 217 families in the area, including women and children. Cristina Palabay, Tanggol Bayi Spokesperson, said Inday Sara, as she is known in Davao, as the first woman mayor of the city clearly expressed her concern on the situation of the urban poor who will be left homeless after the floods hit parts of Davao the past week. “Inday Sara may have lost all ‘lady's graces’ because he punched a man who is hell-bent on leaving people homeless but she definitely articulated a most graceful support for the struggling urban poor in Davao. What she has done, though it may be in such a form, and the efforts she has exerted to temporarily stop the demolition of the poor’s houses show that local chief executives can intervene and decisively stop the dislocation of the urban poor, if and when they take the side of the oppressed. It is rare that a mayor in this country takes the side of the poor,” Palabay said. The urban poor group Kadamay claimed that 10 residents were wounded, including a 12-year-old girl, in the violence that broke out at the site before the mayor arrived. QUEZON CITY – Amid increasing cases of criminality and unresolved court cases, the League of Municipalities of the Philippines (LMP) will help expedite and broaden the reach of services rendered by the Public Attorney’s Office (PAO), the government agency tasked to assist the poor who cannot access legal services. During the signing of the Memorandum of Agreement between LMP and PAO held in Quezon City recently, Mayor Strike Revilla of Bacoor, Cavite LMP President, said that the partnership is aimed to strengthen primarily the Barangay Justice System as a foundation for extending services. “This program will strengthen the Barangay Justice System by providing Barangays with education and orientation. We are going to empower them by holding seminars to deepen their understanding and improve their mediation skills,” said Mayor Revilla. “Our courts are so loaded with cases that can be resolved at the Barangay level if only we can strengthen our Barangay Justice System,” he added. Meanwhile, Atty. Persida Acosta, PAO Chief expressed appreciation to the initiative as it will strengthen and expedite the referral system between the municipalities and PAO. She said, “the program will pave the way for a faster and simple referral and coordination system. For example, any case happening in a municipality where free legal services for the poor are needed, the Mayor can easily refer the case to us,” she explained. The MOA between the LMP and PAO will actively promote and advocate mutual cooperation and coordination for the smooth provision of free legal assistance to the constituent and facilitate continuing dialogues to define future initiatives such as policy changes and reforms. Local Government Units (LGUs) will also provide PAO’s regional or district offices with free office space, equipment and other resources that the program may need. “We have to dream and while dreaming we have to take an action,” said Mayor Revilla. “We cannot do everything in one sitting, but we can always start with this one. We need to help a lot of our constituents but there are only limited numbers of attorneys that can give free legal assistance, now we are solving that problem. We need to start somewhere; and know the problem clearly and give this solution,” he said. BORONGAN, Eastern Samar – Some 1,080 tricycle operators/drivers in Eastern Samar are eligible to get the Pantawid Pasada financial assistance. In the recent list provided by Lito Zacarias of the Department of Interior and Local Government (DILG) four municipalities to include Balangkayan, Can-avid, Dolores and Quinapondan have been allotted assistance good for some 283 trykes. This is in addition to the earlier number of beneficiaries of some 797 from the municipalities of Balangiga, Gen MacArthur, Hernani, Mercedes, Salcedo, San Julian, Sulat, Taft, Oras and Maydolong. Maydolong town was the first LGU to distribute the P150 Pantawid Pasada Assistance. According to San Julian Mayor George Erroba, he and DILG representative Nida dela Cruz will distribute the fund assistance on Tuesday, July 5, 2011. As for bigger and urbanized towns like Borongan and Guiuan, the paperworks are still rolling, said Zacarias. The Pantawid Pasada is a national government program aimed at assisting the transport sector that has borne the brunt of high fuel prices in the past few months. Meanwhile, in the municipalities of Maslog and Jipapad which are upstream, boat operators also clamor for the assistance. There are no land transport in the two inland municipalities which can be reached through the river and thus use outrigger boats for transport. These motorized boats that consume gasoline are also registered in the local government units, according to Maslog Mayor Septemio Santiago. TACLOBAN CITY – After a court decision came out confirming ownership of the Balyuan Property to be that of the province of Leyte, Gov. Carlos Jericho Petilla said the provincial government is not devising a plan ‘as of yet’ to insist on its right and take over the property with the fiesta festivities still ongoing and with the property being used as the center for these activities. “We know how to respect other people’s activities especially that these are for the people and is a religious practice,” Gov. Petilla said in a media interview just as news broke out Tuesday that backhoe and trucks have barricaded the gates of the Balyuan Property after a press conference was held by Leyte board members and Pintados Foundation Inc. members that such decision have already been made by the court. However, the governor said this would not prevent them from taking back the province’s rightful ownership at the “right time”. The governor declared the province would not readily take over the property but is giving city authorities the chance to peacefully turn over the property in accordance with the rulings of the court. “We are simply administrators. Despite everything that happened I know that they (city officials) are men of stature and still know how to respect the law and the court,” Gov. Petilla said. With reports that heavy equipments have barricaded the property, the governor said that still “nobody is above the law”. He lamented that it was only in 2004 that the city and the province united and in good accord with then city Mayor Alfredo “Bejo” Romualdez that the province readily agreed, with the approval of both the city’s and the province’s respective councils, for the said property to be utilized accordingly by the city government. The governor further commented all these can actually be “talked about “. “Puede gad ini pag-istoryahan kon maupay la it sarabot. We should not resort to getting court orders as much as possible if maupay la iton uruistorya,” the governor said. The Regional Trial Court Branch-8 of the Bulwagan ng Katarungan here dismissed the case filed by the city government of Tacloban against the provincial government of Leyte which called for the declaration of nullity of a Memorandum of Agreement (MOA) entered into by the city and the province and questions the ownership of the Balyuan Property. PALO, Leyte – More and more indigent families in Leyte are enjoying hospital privileges through the PhilHealth cards sponsored by the Philippine Health Insurance Corp. (PhilHealth) as it rolls out its second phase on health cards distribution. PhilHealth recently distributed PhilHealth cards to residents of Brgys. Cavite West, Buri and St. Michael to further provide health services primarily to identified poor populace of the province. According to PhilHealth-8 Executive Vice-President Walter Bacareza, these new round of PhilHealth card distribution is part of the 89,000 target beneficiaries they have identified for Leyte alone. For this second round of health card distribution, Leyte has the highest number of identified poor families at 89,584. Bacareza added that this complements well with the provincial government’s LGU-sponsored PhilHealth which has now reached to more or less 160,000 families in the province of Leyte. He likewise lauded the province of Leyte for initiating the highest number of covered indigent families. “I know health services takes up to much in the LGU’s budget but we are glad that for Leyte, the governor is giving health (services) as its top priority,” Bacareza added. Bacareza earlier revealed that as part of their effort to ensure a better service to their clients, they would soon launch a program wherein their agency would link with all PhilHealth accredited hospitals and rural health centers in the region. He said that the program is set to be launched on July 5 with at least 47 government-run hospitals and 53 rural health units identified as their partners. Meanwhile, Leyte Governor Carlos Jericho Petilla said that despite being a costly one, the provincial government of Leyte has decided to renew the thousands of families PhilHealth coverage considering that these cards has helped them a lot. “Without the cards, still they would come to us for help. It would be better to just provide them the health coverage and they can directly avail of the medical services covered by the said card,” Gov. Petilla said.